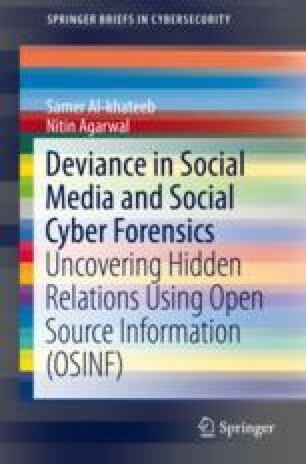 In this chapter, we will introduce the concept of social cyber forensics (SCF) and its usability. Then, we will introduce a tool, i.e., Maltego that can be used to study the cross-media affiliation and uncover hidden relations among different ODGs . In Sect. 4.2 we will provide three stepwise methodologies that can be followed to reach the desired outcome of analysis (e.g., uncovering the hidden relationship between Twitter accounts and a set of websites or blog sites, websites or blog sites and other websites or blog sites, and infer the ownership of a set of websites or blog sites). These methodologies have been tested during many cyber propaganda campaigns to associate and infer the relationships between different online groups. We also provide hands-on exercises to practice each of the methodologies introduced.